I know that I should stop amazing for these things, but I just can’t help it. These are photos of a new shop on rue Ste-Catherine Ouest in Montreal (near du Fort). It has been replacing the old Movieland (physical world video rental, what a backward business model) for at least the past month, I asked one of the clerks. It is basically borrowing from the concept of small shops within a big one that you see a lot over here in my corner of Asia. 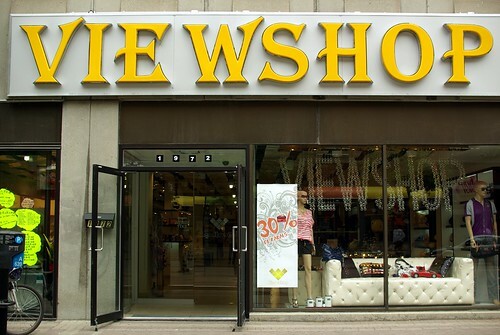 Viewshop is like the little brother of the department store model. 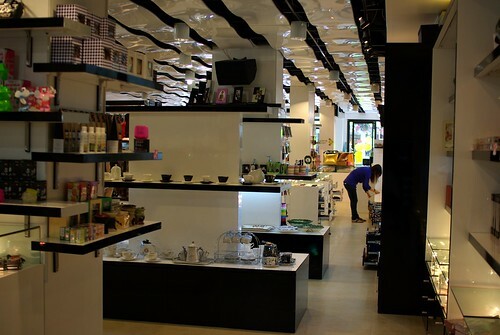 Most of the shop(s) belongs to its owners, but small open spaces within it are rented out to tenants, such as the Korean cosmetics booth (Korean brands like LaNeige are hugely popular all across China). Some of the products sold in the shop are remarkably Chinese. They could be sold in some upscale-ish store in Shanghai or Hong Kong, I feel. On one side, it’s all clothing, all for women I think, and on the other, you would find various electronics gadgets (alarm clocks, USB cup heaters) and fancy stationery (an apple-shaped notepad?). Then, a small (bubble tea) café, and the cosmetics. Yes, the owners are Chinese, after I asked, but wasn’t that already obvious? Yup, that is Montreal’s other Chinatown, far from Asian fonts clichés. My daughter told me about the Viewshop and she took me there Friday night. Wow. Loved the uniqueness of the store, the products, the layout, very clean, nice lighting, the staff very friendly and helpful. I couldn’t believe the prices. Very inexpensive for some very unique items you won’t find anywhere else in Montreal. Great for gift giving for women and tweens. The tea sets are beautiful, something for everyone in this store. I give it a big thumbs up! LOVE. I went there for the first time on Saturday to buy circle lenses for the first time (might I add that they have a large collection!). Everything is beautiful and the service and pricing are amazing. A store I will be visiting A LOT more often. C&C Korean Cosmetics is the only amazing sector in Viewshop. The contact lenses and cosmetics products are all authentic with very good price. The other parts of Viewshop are just filled with overpriced cheap products. C&C is strongly recommended, but not Viewshop. is it really remplace by Movieland? Totally agree with Emma. I purchased a chair from Viewshop and spent almost $200 on it. The leg was broken only one week after the purchase. I went back to Viewshop and the answer was “no refund, exchange only”! Please, just stay away from Viewshop!